Joe @Dude904 McKeehen, Sam @BestInDaBiz51 Panzica and Rayo Kniep mix it up 3-handed with 10 players left in the @WPT $1.408 million prize pool Rolling Thunder $3,500 Main Event. McKeehan (above) makes it 45,000 preflop, his two challengers coming along. The flop of gets a bet and two calls, but it is the turn that gets everyone's attention. McKeehen makes it 382,000 and Kniep reluctantly gets out of the way. Panzica announces all in and McKeehen snap-calls, both players having more than a milly behind. Panzica shows and finds he just ran in to a set, McKeehen showing . 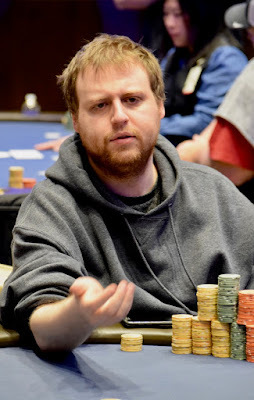 The river gives McKeehen a full double, leaving Panzica just 4BB, and he is eliminated two hands later by Pat Lyons. Panzica cashes for $30,228 in 10th place. McKeehen is now at 2.45 million, a substantial chiplead with 9 left.